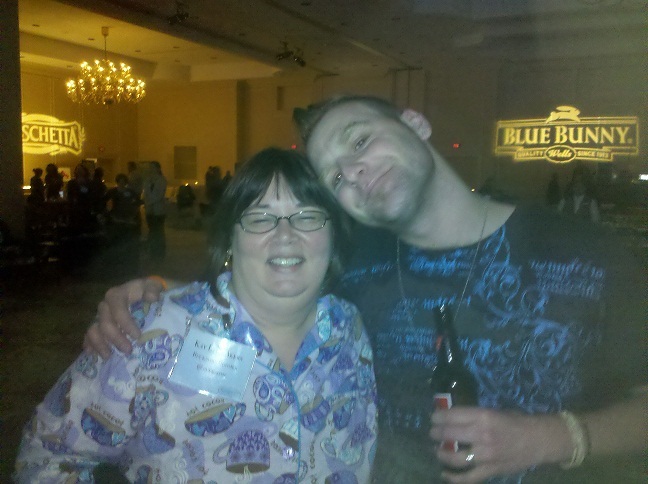 This is the third post about attending Blissdom 2011. Read parts one and two for more details. I had RSVPed in advance to attend a fitness session Friday morning sponsored by Jockey and led by Carla from MizFitOnline. 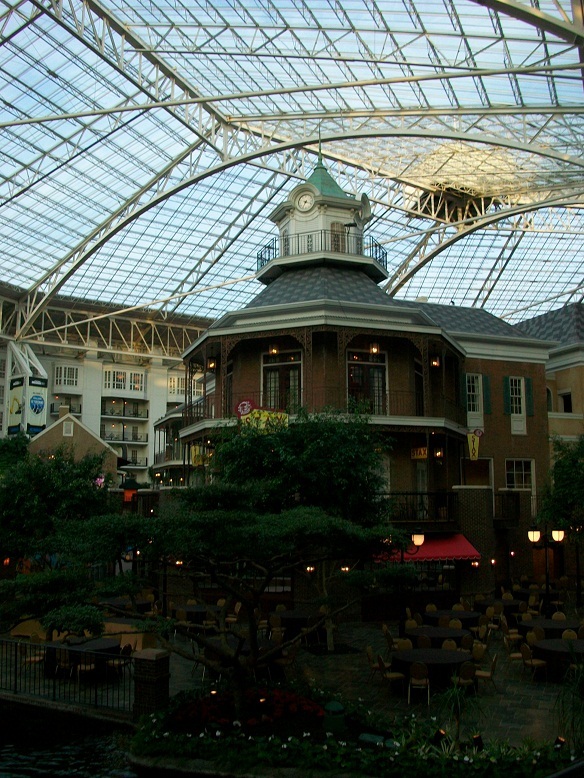 Before the group of about 30 women (and one adorable little boy) started our power walk through the Opryland Hotel, we were given raffle tickets for a chance to win either a pair of Jockey active pants or jacket. I won a pair of pants! We had a half hour session walking through the property and I sneaked in a few pictures also. It was the only time I explored the hotel and wish I had found the time to do more exploring. I also made two new friends so here’s a shout out to Kelly from Kelly’s Lucky You and Cammy from The Tippy Toe Diet. The morning consisted of two breakout sessions. The first one I attended was titled “Collaboration and Curation: How to Amplify Impact through Social Media Alliances”. There were technical difficulties and we couldn’t see the slides but the speaking team were troopers. I think this session would have been good for writers that don’t work with other bloggers or sites already, but wasn’t the best choice for me. I already know the benefits of collaboration. One idea I thought was interesting was having a theme week with guest posts on the same theme but different aspects. The second session I attended was “Advanced Monetization is Not for Whiny Complainers: Make Your Own Opportunities”. This presentation included results from a survey on how much money bloggers are making with twitter parties, brand ambassadorships, giveaways, ebooks and social media consulting. It was interesting to know what’s typical and what’s possible. (Most of us aren’t getting enough from the brands). A sit-down lunch was sponsored by ConAgra Foods which included a cooking demonstration by Celebrity Chef George Duran who helped develop recipes for the “Ready, Set, Eat” program designed for quick meals. 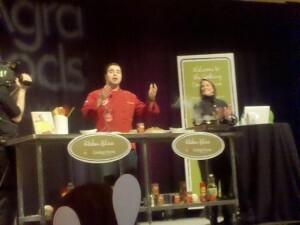 I must say the bruschetta was fantastic and I really enjoyed the chicken. Everyone was back together for the remainder of the day including a State of Bliss session that featured the conference organizers as Wizard of Oz characters. The good vibes and power of bloggers continued with a presentation by Nate St. Piere and Lauren Lankford sharing about Love Drop including a video from the first drop. We also got to participate in a Love Bomb which was pretty cool. My confession for today is that I skipped the closing keynote. I’m sure it was great, but I needed some time to reflect (and start packing) before the evening activities. Heather from Inexpensively invited team members at the conference to dinner and we all met at Solario which is a Mexican restaurant at Opryland. I think everyone liked their food, but we were enjoying chatting together so much I didn’t ask! Despite two days at the conference it was the first time I met Holly from IGoBOGO and the Queen of Free (who wears her crown at all times). Afterwards I changed into my pretty purple PJs for the official activities. Yes, there were lots of pajamas, slippers and casual wear for Girls Night In which featured pizza, ice cream, and more. 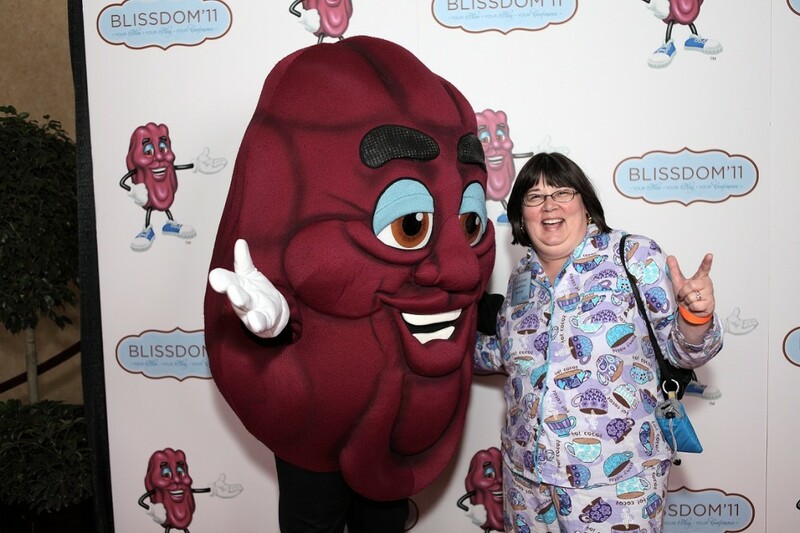 After my grand entrance to meet the California Raisin, I headed over for another chair massage. It wasn’t quite as good as the first, but really can a massage ever be bad? The first performance of the evening was by Chris Mann. I must confess I had never heard of him previously, but enjoyed the music and even hit the dance floor for a while. 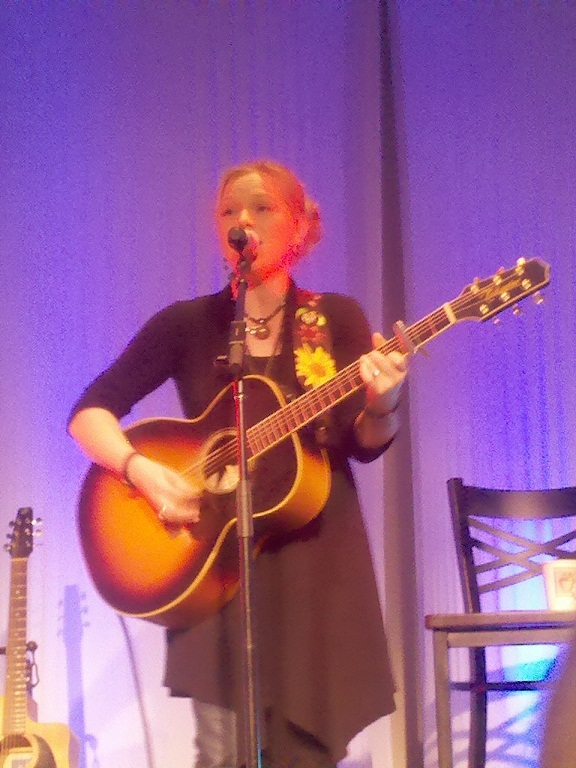 Next on stage was Crystal Bowersox. She was my pick to be the American Idol last season, but it wasn’t to be. I never imagined I’d be watching her perform in such a small venue! It was almost the best part of the evening but was trumped by being surrounded by such great people I would never know except for the fact I started a blog. I even got a picture with the recently unveiled J. Money. Not my best picture, but what can I expect on the third night of parties after a couple of cocktails! It soon became time for this Cinderella to head out. I caught a 5:30 am flight the next morning and started reminiscing about the Bliss. 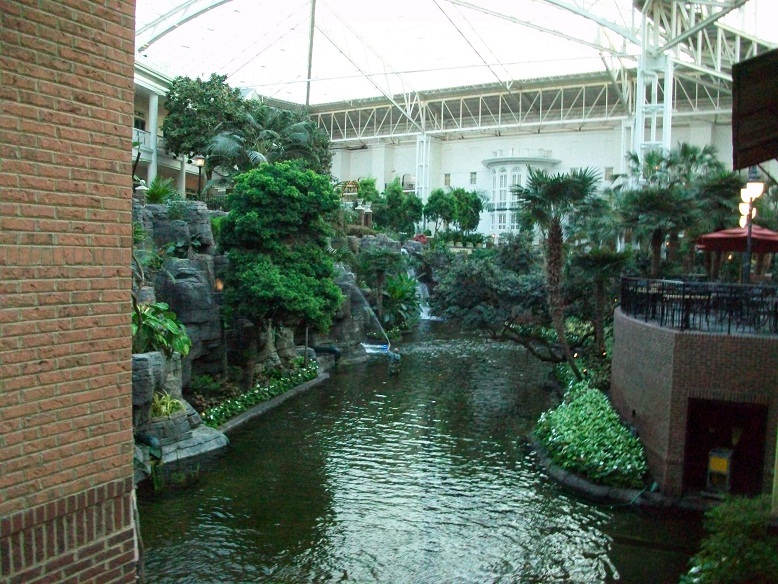 Ahhh…so nice to see Opryland looking like the pre-flood Opryland. I know they had a mess after Nashville was underwater last year, but is looks like they’ve got it all together again. I love that place! You are so fortunate! That trip looks fun. It looks like you had a great time! Sounds like you had a great time! How many people attended total you think? I really need to start attending some of these blogger sessions. Thank’s a lot gor this post and for those previous I really enjoy reading them! Keep doing your best! ……………..Anyone in doubt about the devastation that burst pipes can cause need only listen to the tale of one retirees home heating howler which has left his home in a terrible state . Relatives have reported visiting the property to find water leaking into rooms flowing down walls and even coming into contact with live electrical socket..Gerard McAtarsney Mr McCooe s nephew said that the house is in a terrible state . I couldnt believe it when I opened the door he remarked..The concerned relative added that there has been major damage to the property the water has pulled plaster from the walls destroyed many of the ceilings and damaged many of Mr McCooe s personal possessions..He is not the only person to have been shocked by the scenes in the bungalow Councillor Michael McGoldrick also visited the home and was taken aback by what he saw. Next post: Read Bucksome Boomer on Your Android Device!